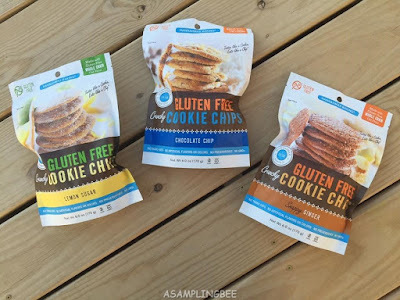 A Sampling Bee: Cookie Chips- Gluten Free Review & Giveaway! Happy Tuesday! Welcome to A Sampling Bee. 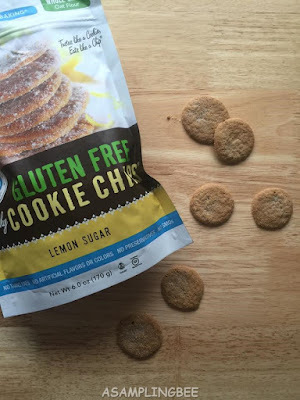 Today, I share with you my review for Gluten-Free Cookie Chips! These gluten-free cookies are perfect for anyone who is allergic to wheat. Just because you have a gluten allergy doesn't mean that you cannot enjoy yummy cookies like the rest of us! It seems like gluten-free is getting more and more popular these days. And with that, I see a lot more snacks available for those people with this allergy. Hannah Max Baking makes there Gluten-Free Cookie Chips in 3 flavors. Chocolate Chip, Lemon Sugar & Snappy Ginger. 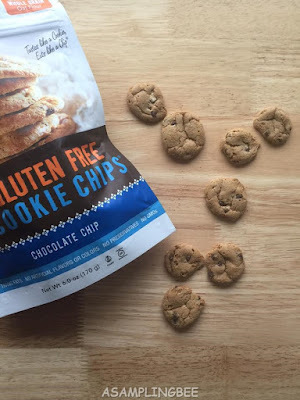 These delicious Cookie Chips are made with only the best ingredients. Cookie Chips are also available in non gluten-free. Read my review HERE. These are amazing. I tried both gluten-free and with gluten and they both taste the same! Hannahmax Baking sure knows how to make a gluten-free cookie! These 3 flavors are awesome. I especially liked the Lemon Sugar. Each cookie flavor is unique and delicious. Cookie Chips are crunchy, not soft. They resemble the size and width of a potato chip, hence Cookie Chip :) I highly recommend these. They are perfect for a snack or after dinner dessert. The convenient packaging allows you to re-seal the bag to keep the cookies fresh. 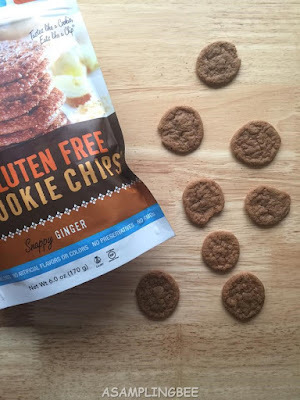 The gluten-free Cookie Chips are made with gluten-free whole grain oat flour. They contain NO trans fat, artificial flavors or colors, preservatives and they are non GMO. I received Cookie Chips in exchange for my honest review. All opinions are my own. Always! Enter to win gluten-free Cookie Chips! One winner will receive ONE bag of each flavor. (1) Lemon Sugar (1) Snappy Ginger & (1) Chocolate Chip. Open to the US only. Oh yum! Those sound so good. I definitely want to try a bag of these. My children eat gluten free so its nice to find a quick on the go snack option. They have certainly come a long way with gluten free stuff. I agree! They really have! They have certainly made gluten food look more appetizing than it did a few years ago and this looks delicious. These would be perfect for school lunches. It's nice to know they're natural and GMO free. I am more of a chocolate chip kind of gal, so I would totally go for that flavor. Love that the cookies are thin! Definitely the perfect snack for in between meals, or for when you're craving for something sweet. I need to try these! Crunchy cookies are the best, and just the name, "cookie chips" has me drooling! I am so glad to see so many more options in the gluten free world. It is really nice to be able to have cookies to snack on! I love cookies, and gluten free? i love it, id like to try one of those. yum! I have never really cared much for gluten free or not as long as it tasted good. Now that I am getting older I am actually considering healthy alternative and this sure do look like it is both tasty and a healthy option. Hi Angela! They are delicious and healthier! Gluten free? Woah I love cookies more! Glad you shared it! Thanks. My kids would love these. I try not to have too much cookies around but since they are gluten free these would be really good for my son. I've not tried gluten free food but have been hearing a lot about it so might try these cookies see what the fuss is all about :) thank you for sharing! They're really good! You'll like them! I need to try these. I just was diagnosed with gestational diabetes and these would be a perfect option while I'm pregnant. You'll love them! Prayers headed your way! I saw "chocolate chips" and "gluten free" and my eyes opened WIDE. 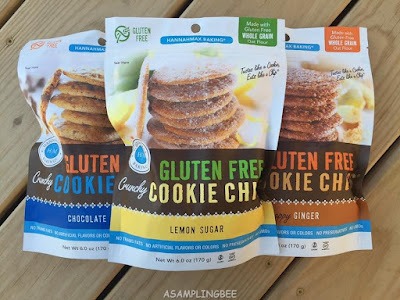 I am gluten-free, am totally entering this giveaway and can't wait to try these cookies out!! I think these look and sound delicious especially for being gluten free. They would make a great snack of sweet treat! Such a wonderful giveaway, this is good. I love eating cookie chips that is gluten free. I simply love this cookie chip! Thanks for this great giveaway too! Hoping to win! That's great that they're gluten-free. They look delicious. These would be perfect for school lunches. Love knowing that they're natural and GMO free! Will check them out! These sound so good! And gluten-free is always a plus! Oh this would make a nice little snack for my kids. Perfect to pack for a snack! I've never tried these but they sound very good! The Lemon Sugar would be my favorite. Hubby and the little ones would go for snappy ginger! 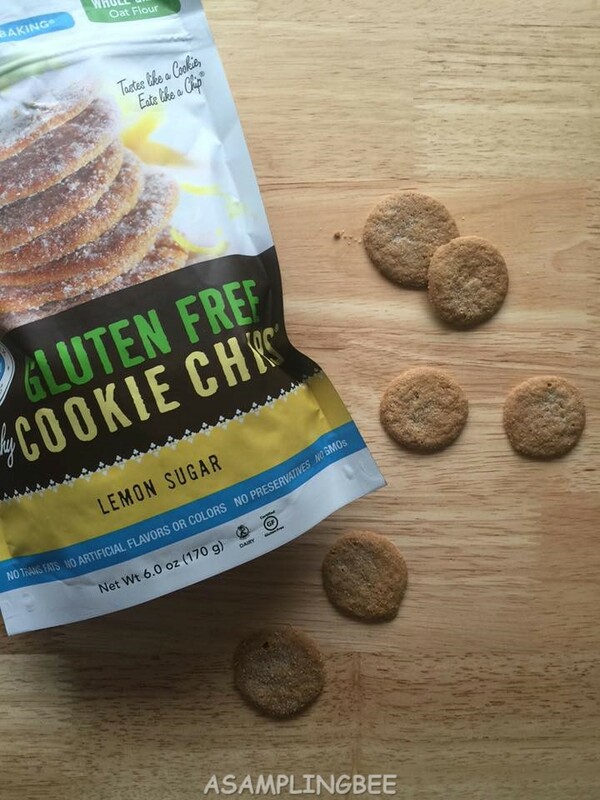 We love finding out about gluten-free products we can add to our meals and snacks. Thank you! The Lemon Sugar is sooo good! I've seen similar cookie chips around and they've all been so good! I bet these are amazing as well. I love that they are gluten free!